Out of chaos comes creative solutions…well I hope so! My mother is a genius, in addition to being super cute. She will take the leftover and make them spectacular; or at least useful. If Pinterest and blogging were around when I was growing up she would have been all over it. There have been many times that I have been on the Internet and noticed so many the things my Mom has been doing for years. Want to know how to fold a fitted sheet? The woman could have made them fit back in the package when she was done folding. Keep your cords contained by putting them in a leftover toilet paper tube. Check! And make it cute by covering it in contact or wallpaper. Check! My bathroom was ultra organized and matchy when I was little. My Mom would wallpaper the bathroom and then use the extra pieces to decorate toilet paper tubes for the curling iron and hairdryer cords. She would then find all manner of little cardboard boxes that would fit in the drawers to organize all our hair accessories and other bathroom clutter. Of course these were also customized with the wallpaper. I don’t think that even the band-aid boxes escaped. I know that so many of the ideas out there are not new, they are just reinvented or rediscovered, but my Mom didn’t have blogs or Pinterest to show her something new. She either learned it in person or thought it up herself. Now I’m sure she learned how to fold a fitted sheet from my Grandma but I think customized, bathroom organization was all her own. (I’m going to see her at dinner later so I’ll double check.) I picked up many things from my Mother. I can fold a fitted sheet, thank you very much. Some things I didn’t want to repeat. I hate wallpaper with a passion! (I wonder why….hmmm) Others I just simply forgot. Like today’s little gem ~ the Milk Jug Plunger Holder. Yesterday our toilet was clogged (maybe TMI, but this is where the inspiration comes from) and I asked my daughter to go get the plunger from the basement utility room. Now my sweet, little girl (who is now 14!) thought it was icky to carry the plunger and that made me think, “Why haven’t I ever made Mom’s toilet plunger holder?” I think it’s because my husband takes care of most of the plumbing issues and I was never worried about him being grossed out. The genius of this little contraption is that you have a nice place to store your plunger and it’s not sitting on the floor somewhere. But wait there’s more. It also sports a convenient carrying handle to keep the two together when transporting it. And you can get all this for the low, low price of……FREE! Well, as long as you drink a gallon of milk at some point. 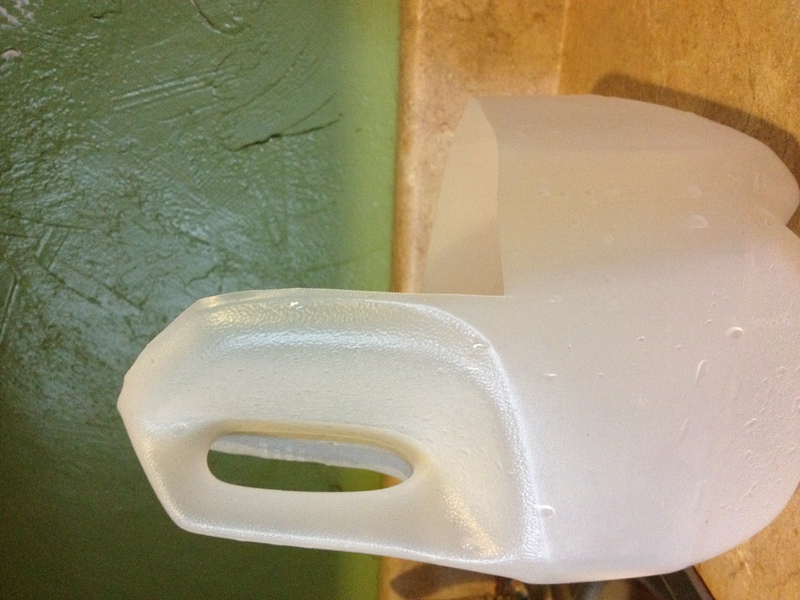 All you do is clean out an empty gallon sized milk jug and then cut out the part you don’t need. I just used scissors (you could also use a razor blade or utility knife but it would be a bit trickier) to snip into the side opposite the handle. 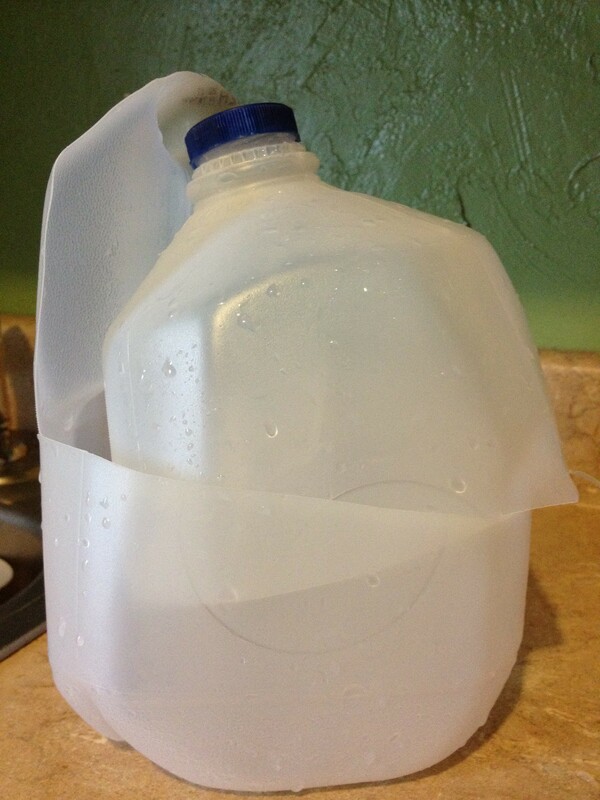 I then cut around the width of the jug until I got to the bumpy part of my jug. Your jug may not have this but if you look at the pictures you can see how much to leave. I then went up and over cutting of the spout but leaving a little extra by the handle. Keep cutting down and around and your done. I did go back and even everything up so there were no sharp plastic pieces. 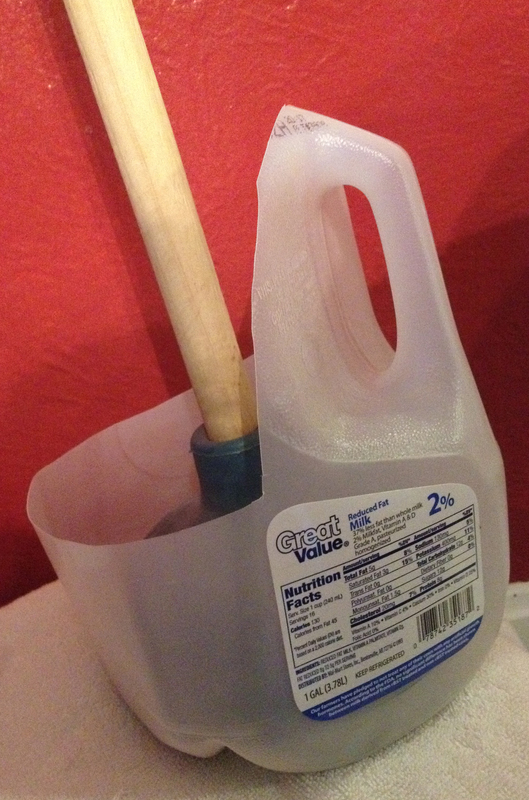 We now have an icky-free way of storing and transporting our toilet plunger and we re-used an item. Genius, I think! This entry was posted in Useful Things and tagged genius, holder, milk jug, Mom, toilet plunger. Bookmark the permalink.